One of the goals of research in the Halasyamani group is to develop structure-property relationships. To this end, we have extensive characterization capabilities (Chem. Soc. Rev. 35, 710-717, 2006). • Powder second-harmonic generation (SHG) measurements at 1064nm and 532nm. The Maker Fringe measurements allow us to determine individual SHG coefficients, dij’s. We also have the capability to index, cut, and polish crystals. Our physical property characterization capabilities in combination with our synthesis and crystal growth expertise make the Halasyamani lab rare, if not unique, with respect to functional inorganic materials. 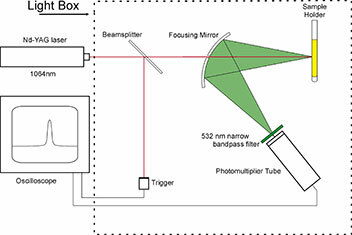 Schematics of our measurement capabilities are given below. We are happy to collaborate and perform any of these measurements on samples sent to us. Please contact Prof. Halasyamani (psh@uh.edu) if interested.